Hi, I am trying to decide how to run water to my backyard for my irrigation system. In the picture above, you see the front corner of the house, where the house mainline both enters the crawlspace to feed the house and where it splits to feed the front yard sprinkler valves. The backyard valves need to go just behind the fence you see on the right. There is currently no external hose bib or anything on that side of the house in the back yard. 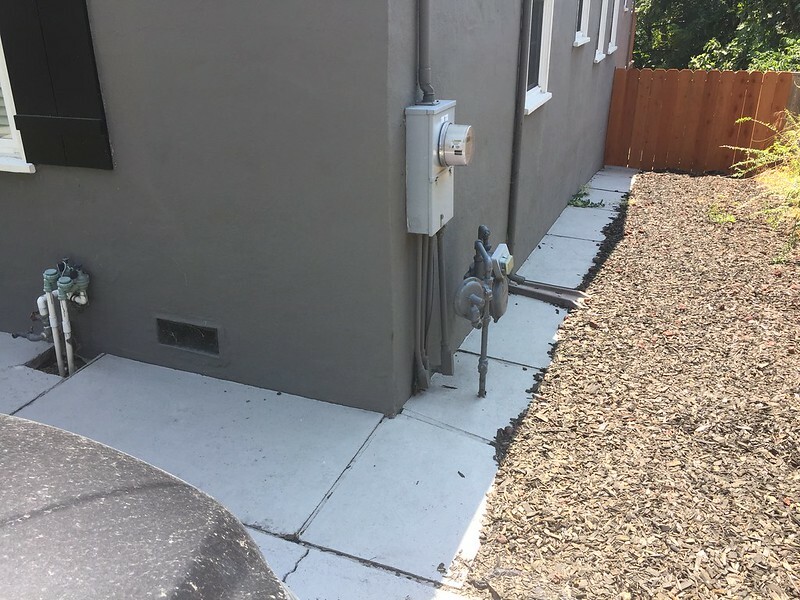 The other option would be to trench along the side where all the mulch is and run PVC under the fence, all the way up the side, under the concrete pad and up to the front yard sprinkler point of connection. Clearly much more work, and I know that area also holds the sewer lateral, and probably gas too (you can see the meter in the picture). Crawlspace. You may not be able to take advantage of a nearby pipe, if that pipe is running soft water. For best performance, you source your connection as close as you can to the where the water supply enters the crawlspace. Once upon a time, this would be done with copper, but copper can be pricey. PEX tubing would be a plumbers choice, but they already own the expensive tools to assemble PEX fittings and tubing. Another plastic plumbing system has been around for decades, which is CPVC, which is a hot-water-compatible version of the white plastic plumbing coming from the antisyphon valves in your photo. Unlike the white PVC, the tan-colored CPVC is permitted for indoor potable-water plumbing. The CPVC seen at a home center will not match the dimensions regular PVC, since they market it for use with special push-on fittings with names like Sharkbite. However, there are now standard slip fittings made for this CPVC pipe, so it can be assembled in the old glue-it-together style, using the cement that is made for use with CPVC. Thanks for the reply. To be clear, your suggestion is to tap in the crawlspace right where the main line enters, then run a new pipe to the back of the house, as opposed to following the existing pipe to the back of the house and tapping there? Also, I just realized the main line under the house is galvanized. Any way to tap into that successfully? You can start from downstream of the galvanized, if it helps. A few feet one way or another won't matter. There are compression tee fittings that let you cut in a connection, should you have no choice but to work with the galvanized.